Congratulations to Daniel Celella for taking home CSCL’s Annual EXCEL Award for excellence in his job as a CSCL manager. Q: How long have you been with CSCL and what do you do? A: I started with CSCL in 2015, I am currently working as a HomeShare Manager. 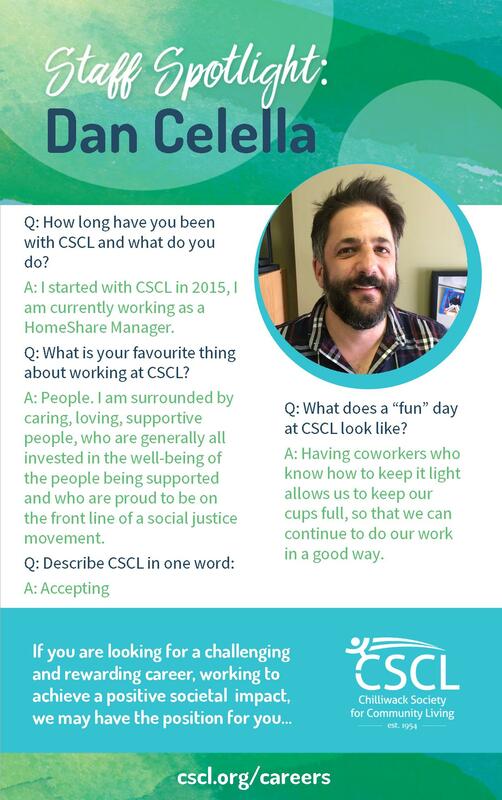 Q: What is your favourite thing about working at CSCL? A: People. I am surrounded by caring, loving, supportive people, who are generally all invested in the well-being of the people being supported and who are proud to be on the front line of a social justice movement. Q: What does a “fun” day at CSCL look like? A: Having coworkers who know how to keep it light allows us to keep our cups full, so that we can continue to do our work in a good way. Are you interested in a challenging and rewarding career? Apply today!